Wellness is to disease, as apithology is to pathology, writes @willvarey @apitholo. Apithology is a word created to describe a timeless concept in a modern context. It is not known whether the word apithology also has an ancient meaning. It has been formed as an entirely new term to describe a distinct and novel conception. The term originally emerged from the development of a field of practice that in essence is the counterpart to its opposite, being the research field of pathology. 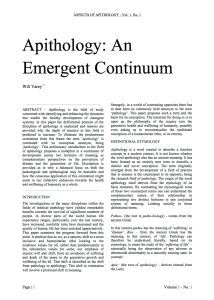 The origin of the word apithology itself derives from the etymology of its basic elements. By contrasting the etymological roots of these two counterpart terms one can understand the complementary nature of their relationship in representing two distinct horizons in one conjoined system of meaning.